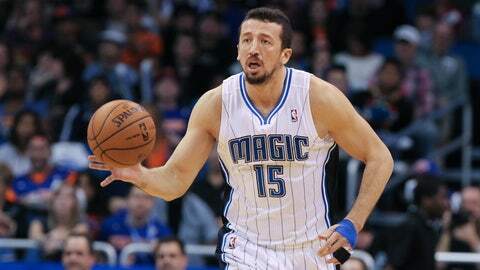 Hedo Turkoglu ranks sixth on the Orlando Magic's all-time list in points (7,216) and games played (497). Hedo Turkoglu’s long, eventful and checkered history with the Orlando Magic came to an end Friday when the team announced it had waived the forward who was an integral part of the Magic’s march to the NBA Finals in 2009. The move was hardly unexpected. By waiving him before next Friday, when all NBA contracts for this season become fully guaranteed, the Magic will avoid having to pay the 34-year-old Turkoglu the remaining $6 million owed him. Although he was on the Magic’s inactive list all season, Turkoglu had not so much as been with the team since both sides agreed over the summer that he didn’t fit into their future plans. The native of Turkey, who began his pro career in 2000 with the Sacramento Kings, ranks sixth on the Magic’s all-time list in both points and games played. Only Dennis Scott and Nick Anderson have made or attempted more 3-point field goals than Turkoglu, who was named the league’s Most Improved Player in 2008. Turkoglu averaged 14.5 points, 4.5 rebounds and 3.8 assists over a career with the Magic which began in 2004 and resumed after he was acquired from the Phoenix Suns in a trade on Dec. 18, 2010. But he may have been at his best in the 2009 Eastern Conference finals, when he averaged 17.2 points and more than six rebounds and assists as the Magic eliminated LeBron James and the Cleveland Cavaliers in six games. After the Magic were beaten in the NBA Finals by the Los Angeles Lakers, the Toronto Raptors signed Turkoglu to a five-year contract worth $52 million. He lasted just one season with them before going to the Suns, who later sent him, Jason Richardson and Earl Clark to Orlando in a trade where the Magic gave up Vince Carter, Marcin Gortat, Mickael Pietrus and a 2011 first-round draft pick. Turkoglu’s second go-around with the Magic went nowhere near as well as his first. He played in only 11 of 82 games last season, suffering a fractured left hand in the season opener and being suspended 20 games by the NBA for taking a banned substance. The Magic kept him on their roster in the hopes that his expiring contract might make him of value to another team. But general manager Rob Hennigan was never able to pull off a trade involving him. Reports have suggested the Lakers and the Atlanta Hawks have shown interest in signing Turkoglu to a 10-day contract once he clears waivers.